Despite my previous post “LinkedIn Policy Is Guilty Until Proven Innocent” being only three weeks old, it’s already climbed to be the third most viewed post I’ve written to date. I guess the perceived injustice of LinkedIn’s policy on discussion posts and spam touched a nerve with many. It should, if you actively post discussions to groups. Many people asked me where on LinkedIn’s website they could read about this policy. I tried to find it before I wrote that post and couldn’t. All I had at the time was private correspondence between me and LinkedIn Support, as well as what other have shared (also correspondence). While the above link illustrates that users have been impacted by this policy, it’s still just a forum. It’s not something “official” from LinkedIn. Therefore, I’ve decided to share correspondence that I received from LinkedIn, because I feel it’s important to back up my criticism of their policy with something factual. In a final attempt, I asked them once again for a link or URL they could point me towards which specifically details this new policy. Sadly, they hide behind a generic user agreement and apparently do not address this specific policy on their site. So at the end of the day, LinkedIn is a free site. You’re not forced to participate. They get to make the rules. If you don’t like them, that’s your problem not theirs. 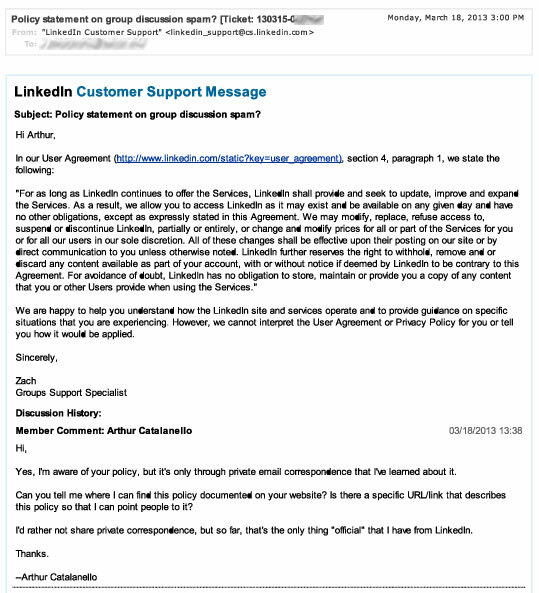 “Guilty until proven innocent” is the message that LinkedIn is sending with one of their recent changes (and there have been many) that you probably have not heard about. 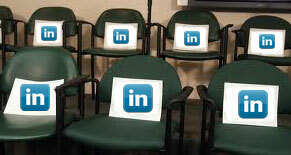 LinkedIn is making a concerted effort to reduce spam in groups. That’s a good thing! The problem is, they’ve created a new policy that’s an over-reaction along the lines of throwing the baby out with the bath water. Group managers in LinkedIn have a lot of power. They can create rules for their group and decide if group membership should be open to all or closed (requiring approval). As a closed group, they’re able to create criteria to join the group. They have the ability to restrict the types of discussion posts that are allowed. They could move a discussion to a promotions or jobs board instead of the main discussion board. Group managers are able to delete a discussion they felt was inappropriate for whatever reason. Further, should a group member be a repeat offender or have an egregious post, a group manager could place that member into a restrictive status where future posts would have to be moderated for approval. As a final step, group managers have the ability to remove someone from a group and/or block them. That’s a lot of power! And as a Voltaire (allegedly) originally said (in French), “with great power comes great responsibility.” If you belong to groups on LinkedIn, you undoubtedly belong to some groups that are managed well and some that do not. That’s either the hard work and dedication of good group managers or the failure of poor ones. Either way, it’s on the managers’ shoulders (and should be). 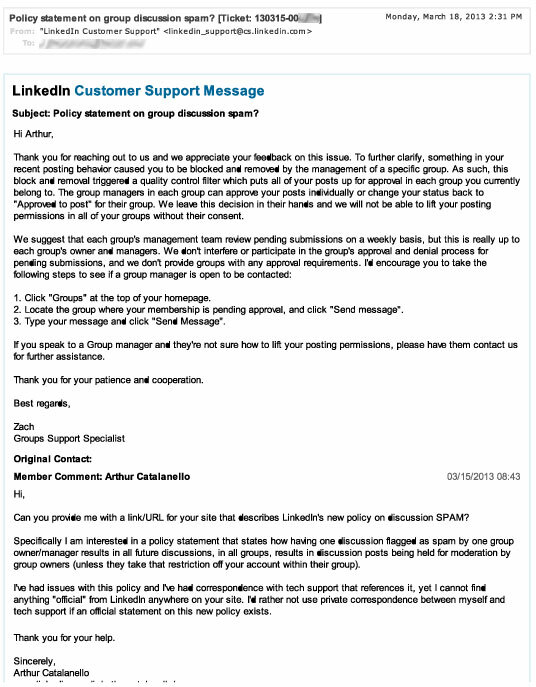 LinkedIn now has a policy that if one group manager or owner flags just one of your discussion threads as spam, your account is flagged as a spammer. As a result, your account is flagged for moderation in every group you belong to, not just the group that originally flagged you. It’s automatic. There’s no review of your posting history. There’s no investigation to see if what was posted was truly spam. There’s no appeals process. You’re guilty. Period. What constitutes “spam” becomes arbitrary and inconsistent. If you want to be unrestricted, you have to ask the group owner/manager of every group you’re a member of to remove you from moderation. It places additional administrative work on both the user and the group owner/manager. Rather than letting managers manage the groups the way they want to, LinkedIn has become “Big Brother” and will paint its users with a broad brush, fairly or unfairly. Yes, LinkedIn is a free site and they get to make their own rules. But, with great power comes great responsibility. Unfortunately, LinkedIn’s efforts to curtail spam by assuming guilty until proven innocent is lacking responsibility. 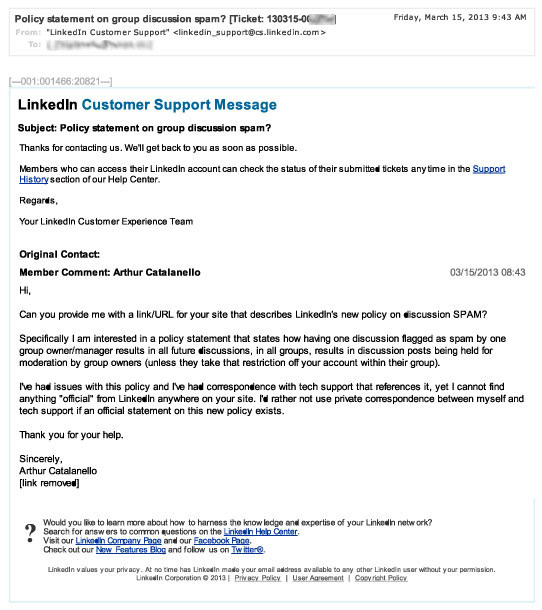 What’s your opinion of LinkedIn’s policy? 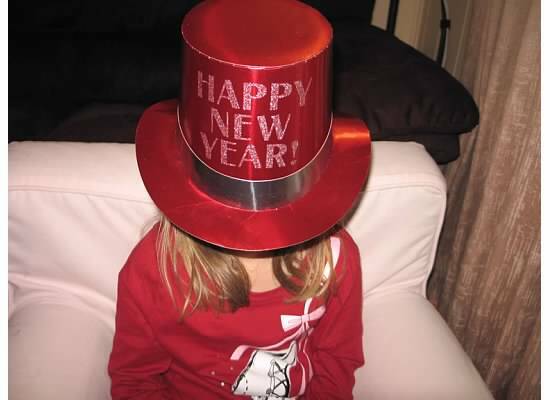 Is it appropriate? Effective? An over-reaction?